Google has recently announced Android One, a design reference platform that will let smartphone manufacturers to create ultra-cheap smartphones smoothly. This move by Google is a major boost for entry-level smartphones powered by Android OS. 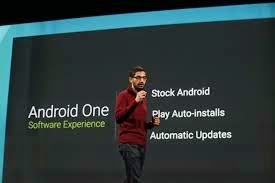 At Google's annual developer conference I/O 2014 in San Francisco, Sundar Pichai, Google's head of Android and Chrome platforms said Android One will enable smartphone maker's resources to build a reference platform for smartphones, thus it saves valuable time and cut down expenses. Android one powering these low price smartphones will boost Android market. Like Google Play Edition products, Android One smartphones will get software updates from Google. Google will start it from India and it has already made Spice, Micromax, and Karbonn as its partners. Pichai gave example of Android One-powered Micromax smartphone, which will have a 4.5-inch screen, dual sim , microSD card support and FM radio priced under Rs. 6000. Google has revealed that Android is used by a more than billion users and the Android One's purpose is to reach out all remaining smartphone users. Right now only 10% of Indians use smartphones and Google's this move can lead Android-based smartphones reach to many more hands. There are some Rs. 6,000 and below Android smartphones are available in the Indian market, but because of cheap quality hardware it gives poor user experience. Android One devices are promising option to deliver good performance without high price. If all goes smooth Google can turn simple phone users into smartphone users and its OS users count can increase substantially. Penetration Testing Apps For Android Devices!